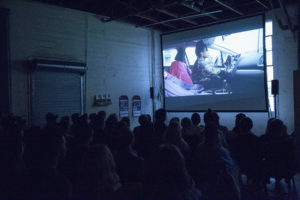 Images from the screening of "Incense Sweaters & Ice" and discussion at 356 Mission. April 29, 2018. 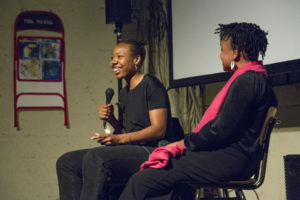 Martine Syms and Erin Christovale in conversation following the screening of "Incense Sweaters & Ice" and discussion at 356 Mission. April 29, 2018. 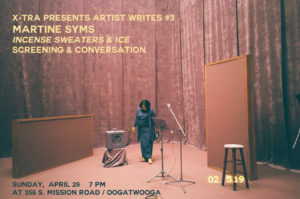 In conjunction with the publication of Martine Syms’s contribution to X-TRA Artist Writes, X-TRA and 356 Mission are excited to present the Los Angeles premiere of Syms’s film Incense Sweaters & Ice, followed by the artist in conversation with Erin Christovale. 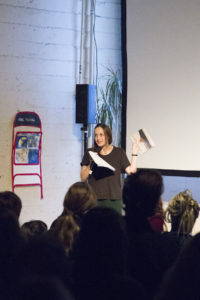 This program is part of X-TRA’s Artist Writes series, commissioned essays and lectures by A.L. Steiner, Andrea Fraser, Martine Syms, and Pope.L. 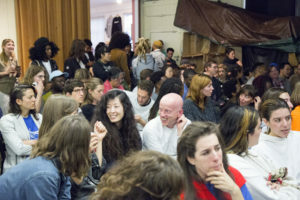 Artist Writes is grounded in X-TRA’s mission to provide a platform for artists to define their own terms of engagement and to make meaningful contributions to the fields of criticism and theory. This will be the Los Angeles premiere of Incense Sweaters & Ice (2017). 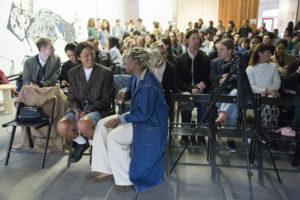 First presented as an installation at MoMA in New York, this is the first Los Angeles showing of the single-channel version of the work. Shot on location in Los Angeles, Chicago and Clarksdale, Mississippi, the new feature-length work by artist Martine Syms follows routes of the 20th century Great Migration of African Americans. Girl, the central character, is depicted in her daily life, and as she interacts with WB (White Boy) in person and over text message. This multi-location narrative is never overtly region-specific, yet is psychogeographic in origin. Similarly ambiguous, the camera occupies multiple vantages in the film including WB, the interviewer, and the omnipotent observer, serving to chart the ways we document ourselves and the lives of others. While the chameleon-like role of the camera as silent observer deflects Syms’s role as director, her presence can still be felt off-screen, and in a brief cameo appearance. 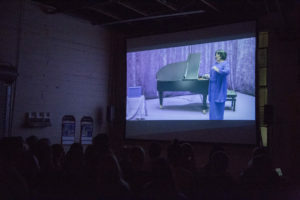 Interweaving biographical narratives with fiction, the film includes empowering interludes from Queen White, who delivers motivational monologues to the camera from a purple room, providing a soundtrack to Girl’s anxieties and meditations. By using purple as a signature device in many of her works, Syms refers to Alice Walker’s 1982 novel The Color Purple: a recurring motif and reminder of the underlying oppressive racial structures, and their origins, in the United States. Martine Syms (born 1988) lives and works in Los Angeles. 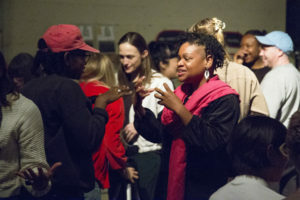 Her recent solo exhibitions include Projects 106: Martine Syms, Museum of Modern Art, New York, The Easy Demands, CONDO: Bridget Donahue hosted by Sadie Coles HQ, London (both 2017) and Fact & Trouble, Institute of Contemporary Art, London (2016). She has participated in numerous group shows including Future Generation Art Prize 2017, Pinchuk Art Centre, Kiev, Commercial Break, Public Art Fund, New York (2017) and Made in L.A. 2016: a, the, though, only, Hammer Museum, Los Angeles (2016). She is founder of the independent publishing house Dominica. Erin Christovale is the Assistant Curator at the Hammer Museum in Los Angeles. 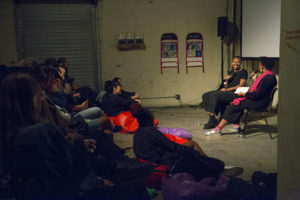 She is also the curator of Black Radical Imagination with Amir George, which has screened both nationally and internationally in spaces such as MoMA PS1, MOCA Los Angeles, and the Museo Taller José Clemente Orozco. Exhibitions include a/wake in the water: Meditations on Disaster (2014) at the Museum of Contemporary African Diasporan Arts, Memoirs of A Watermelon Woman (2016) and A Subtle Likeness (2016) at the ONE National Gay and Lesbian Archives, and S/Election: Democracy, Citizenship, Freedom (2016) at the Los Angeles Municipal Art Gallery and baby boy (2017) at Transmission Glasgow. She recently organized the 28th anniversary of ALTERNATE ENDINGS, RADICAL BEGINNINGS with Vivian Crockett as part of Visual AIDS’ project, “A Day With(Out) Art” and is currently organizing Made in L.A. 2018 with Anne Ellegood at the Hammer Museum. 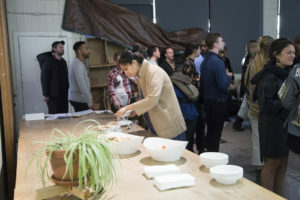 Support for the X-TRA Artist Writes series has been generously provided by the Michael Asher Foundation, The Andy Warhol Foundation for the Visual Arts, Isambard Kingdom Brunel Society of North America, and Pasadena Art Alliance.